Main photo: USA Women's Eagles 7s team members, Kathryn Johnson, Kate Zackary and Megan Bonny. Kate Zackary, pictured on the left, holding her USA jersey. 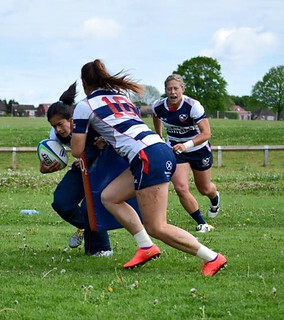 Coming up to assist fellow USA Women's Eagles 7s teammate, Irene Gardner, during practice (picture on right). NSCRO guest contributor Kate Zackary writes about the misconceptions on the quality of sports programs in small colleges. Kate played varsity soccer and club rugby at NSCRO school Benedictine College. 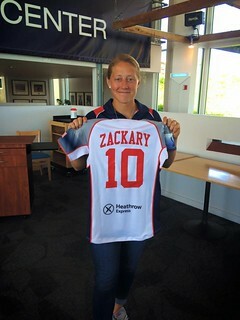 Last year Kate moved to the Olympic Training Center in San Diego where she is a member of the USA 7’s Women’s National Team preparing to represent the USA at the 2016 Olympic Games in Rio. Now, I may be biased as I attended an NAIA school that housed a total of 1,100 students my freshman year, and found myself competing against some exceptional athletes. I played soccer at Benedictine College (KS), and during my four years had the pleasure of going head to head with Brazil Youth National Team players, and scored on a goalkeeper that would go on to play in the 2015 Women’s World Cup, for the Colombian National Team. Those are pretty elite athletes in my book. At this point, you are probably wondering why I have written a piece for a rugby newsletter? Well, a bit more about me. I attended college on a soccer scholarship but it was there that I would see rugby for the first time. After varsity soccer was over I found myself playing rugby with the Benedictine Saints. Eight months after my rugby career began, I had the pleasure of meeting the very persistent Bryn Chivers. Bryn fell upon a YouTube video of a match versus Kansas State University, and went to bat for me when he contacted USA Women’s Sevens Coach Ric Suggit about attending a National Team camp in April. Following the five-day camp, I returned to Kansas, back to my job, my gym, and my normal life. Seven weeks later that would all change. In June of 2014, I quit my job, left my comfortable life in cozy Kansas, and moved cross-country to California to begin training full-time with the USA Women’s Sevens National Team. Fourteen months have passed and I am still here. In the last eight months, I have participated in four Women’s Sevens Series Tournaments (Atlanta, Canada, London, and Amsterdam), qualified for the 2016 Olympics in Rio at The NACRA Championships, and earned the Silver Medal at the 2015 Pan-American Games – the first time women’s rugby has participated in the event. I want to reiterate that my rugby career was sparked at a small college. It was there at Benedictine that I truly discovered my talents, and received direct support from my coach and teammates. Our team was never larger than 26 players during my career, where you might find yourself up against 40-50 at a bigger school. This is a huge benefit of a small program, as you can honestly get to know each individual on your team beyond surface level, and still maintain a competitive environment. Our program consisted of just one coach, and one student assistant, so players relied heavily on teammates for support and advice. Luckily for me, my coach, Lincoln Roblee, is a very dedicated man, who to this day sacrifices so much time and energy to ensure that he can help each and every one of his players, past or present. A coach like this is what any athlete needs to succeed, not necessarily a big college with a big name. It is the people you encounter throughout life that will help you become great – let them teach you, push you, and mold you. Those experiences at Benedictine have never seemed more important until now. There are days that can be grueling, and that are meant to break you, but I find comfort in trusting the process, the same process that got me to California. What does that mean? You have to work hard, day in and day out, on and off the field. Not only should you strive to master the fundamentals of your sport, but you must work even harder to understand your teammates. We train between 4-6 hours a day, five days a week, and are typically pushed outside our comfort zones – it is in these moments that you need to trust your teammates, and your support system, as you all work toward the same goal: gold in Rio. It is a very unique experience, and I am lucky enough to train next to some of the best rugby players, not only in the United States, but in the world! At the end of the day, what I hope you take away is this: there are exceptional athletes in collegiate sports, regardless of division or program size. Do not overlook the smaller programs just to have a “brand” name on your jersey. Find a team that will stand next to you in battle and push you to strive for greatness.